Sweetly B Squared: Luckiest Girl in the World! I like to think I'm raising my children with an attitude of gratitude, but I have to say all the fun stuff my daughter gets to do probably makes it easy for her to love life! Just a little more than a week ago was her first trip to this year's circus. 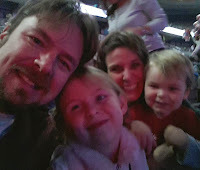 Ringling Bros & Barnum and Bailey presents Dragons was a fabulous show! 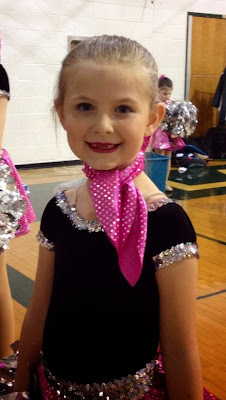 So when neighbor called a couple days later asking if Maggie wanted to go to the circus with them, I made sure they knew she'd already gone once, but then readily agreed that she would LOVE to go again! And of course she loved it the second time too. On our way home, we drove through some of the first snow of the season - YUCK! I was going to drive home after our long day, but I switched seats with hubby since he doesn't mind a little slickness on the road as much as I do. Today Maggie and hubby are out having fun on a daddy-daughter date. They are on their way to the Fox Theater in Detroit to see the Fresh Beat Band live! She was so excited last night when he told her the surprise at dinner after competition. I know they're going to have a great time. As the holiday season gets going, it seems like we've got fun stuff planned all the time. I do love it, but sometimes I wish some of it could take place during the spring and summer time.